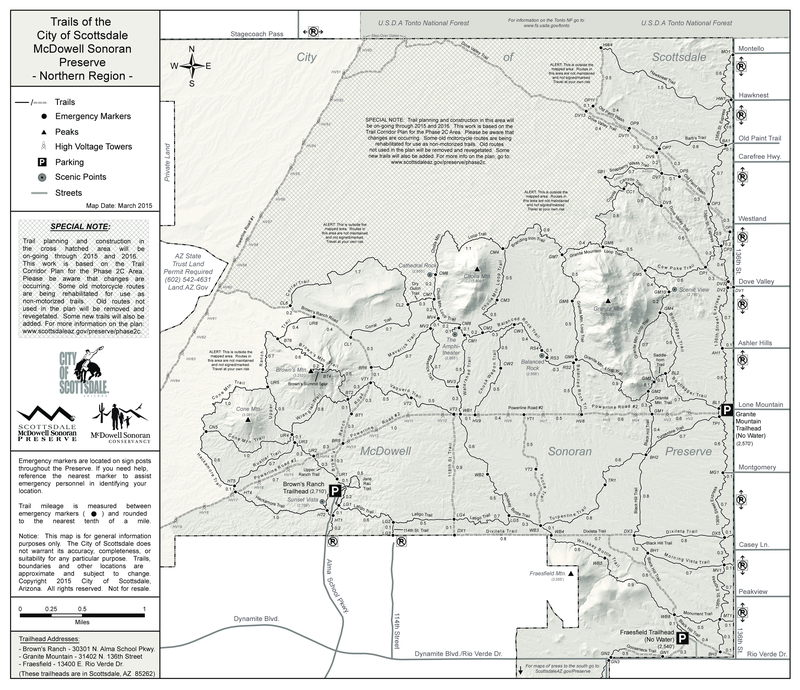 The 2014 guide below is for the original 1.1 mile Latigo Trail. 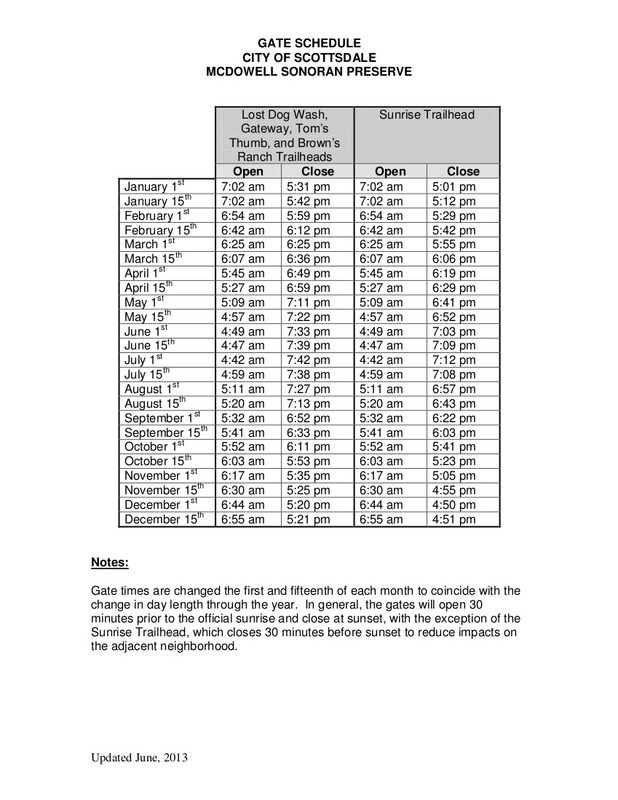 Utilize the new Official Route. 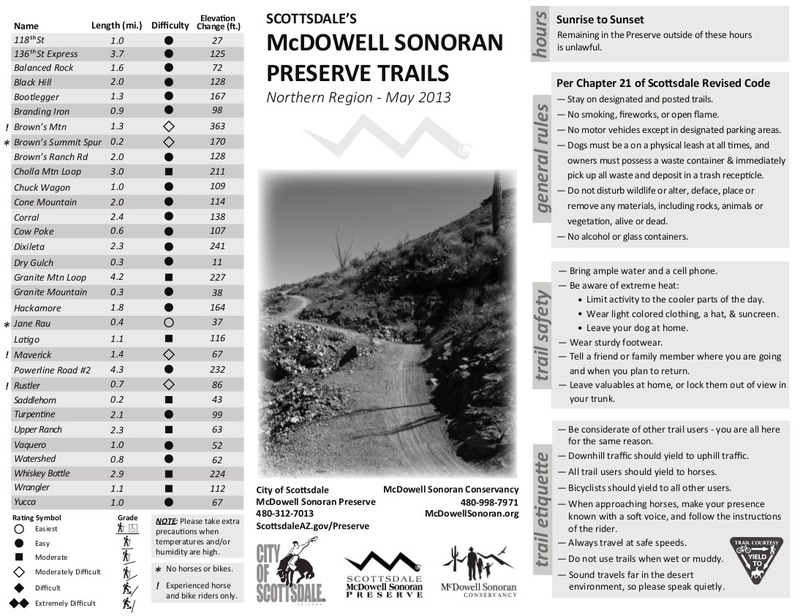 This short, easy trail offers a sample platter of classic Sonoran desert terrain combined with expansive views in every direction of the McDowell mountains. Hikers, mountain bikers, equestrians, and trail runners will be drawn to the wide, firmly packed trail with gentle slopes and meandering turns. 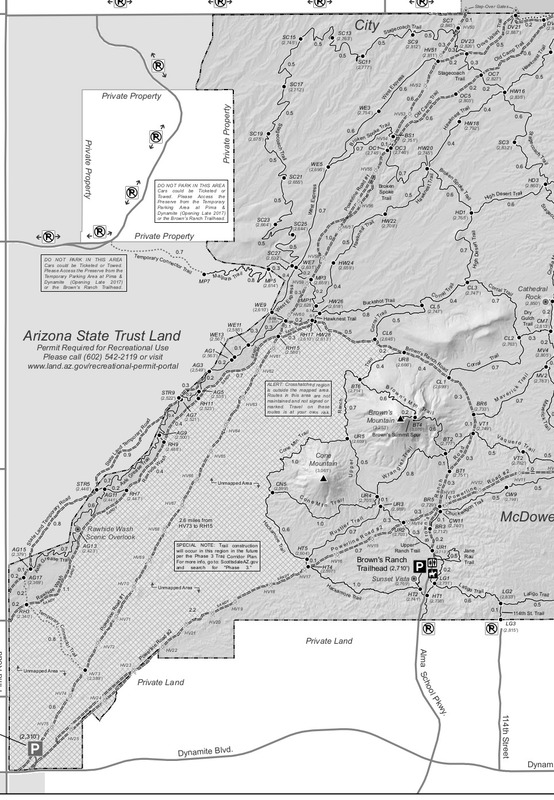 Brown’s Ranch Trailhead is a popular area in the Northern section of the McDowell Sonoran Preserve and garners a full parking lot most weekends from Fall to Spring; however, most visitors are headed out along Brown’s Ranch Road trail and its tributaries. Latigo trail is good option if you are looking for a less crowded route or want to connect to trails near Cholla, Granite, or Fraesfield mountains. Access to Latigo can be found in southeastern corner of the Equestrian parking lot or from the amphitheater heading towards the Jane Rau Nature trail – bear right at this sign and go 0.2 miles to start of Latigo. From trail marker LG1 at the start of Latigo Trail, you head east up and down gentle granite slopes past saguaro, cholla, palo verde, and yucca. I felt like an owl with my head rotating around in all directions to check out the little mountains that pop in and out of view as the trail progresses: Brown & Cone Mountains, Cholla & Granite Mountains, Pinnacle Peak, Tom’s Thumb along the McDowell ridgeline, and Fraesfield Mountain. Some of the higher points of the trail are an ideal location for sunrise and sunset photos. You intersect with 114th Street trail at 0.5 miles and the Latigo trail ends another 0.5 miles later at the junction with 118th Street trail. These two intersecting trails lead south to neighborhood access (no parking access). 118th Street trail continues north to join with Powerline Road trail which takes you either: (1) east to Cholla Mountain Loop and Granite Mountain Loop or (2) west back to Brown’s Ranch Road Trail. 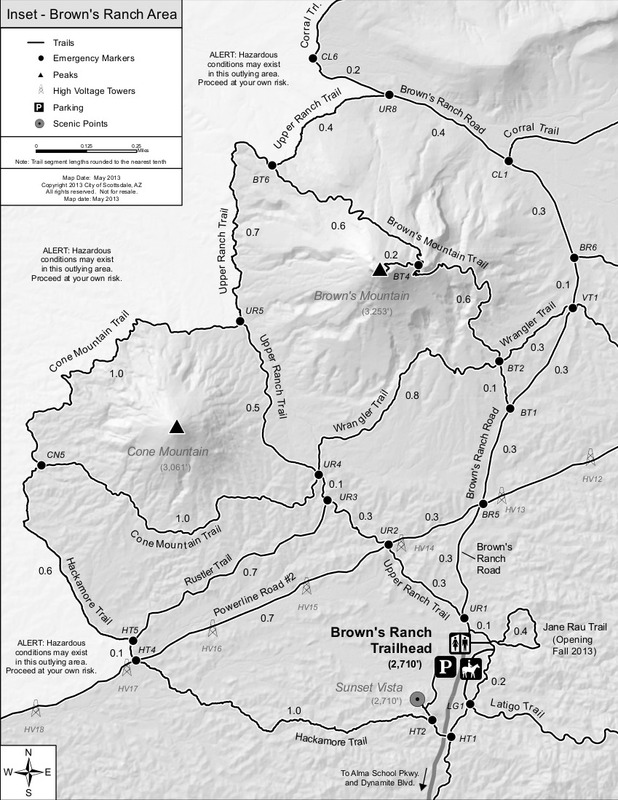 Or to experience the Fraesfield Mountain loops, take 118th Street trail south to Dixileta Trail connector. From the 101 in North Scottsdale, drive North on Pima/Princess drive and go East on Happy Valley Road to the stop sign at the instersection of Happy Valley & Alma School Road. Follow Alma School Road North past Dynamite until it ends at Brown's Ranch Trailhead.